Stay up-to-date on what is happening with Third Coast Percussion. Check back regularly to find our latest news & events. Be sure to join our mailing list, and follow us on Twitter and Facebook. It’s time for the final Intern Spotlight of 2018, featuring Charlie Mogen! 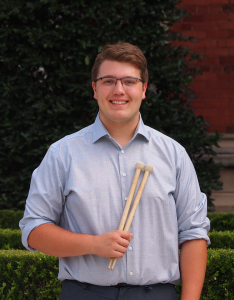 Charlie worked for us in the summer of 2016, and he is now the interim professor of percussion at Augustana University in Sioux Falls, SD. Charlie is also an intern with St. Paul Chamber Orchestra’s Liquid Music Series, where we will be performing on Sunday, December 9, featuring music written for us by Philip Glass and Devonté Hynes (aka Blood Orange). We’ve loved working with him again in preparation for our show. Find out more and get tickets here! Thanks for all your work, Charlie, and we’ll see you soon! What is one thing about yourself that you want everyone to know? I’m generally a very easygoing person but will physically fight anybody who doesn’t think a hot dog is a sandwich. This project is a few years old, but I’m still proud of how the lighting/multi-angle cameras worked out. Really dig a nice multi-media production! I’m the interim professor of percussion at Augustana University in Sioux Falls, working for Kate Nordstrum and the SPCO’s Liquid Music Series in St. Paul, MN, and slinging coffee on the weekends. Trying to figure out my next step but feeling good about my passions and prospects! I had the opportunity to work with Mathew Duvall (8BB’s percussionist) the summer before at Chosen Vale, we hit it off, and I asked him about any ways to intern for/get involved with the group. I was fortunate enough to get an internship with them that also included working with TCP– the rest is history. I was extremely impressed with how organized the “business” aspect of the group was; no group member ever hesitated to do the nitty-gritty work necessary for a well-oiled musical machine. What else did you do while you were interning? Other than the work with Eighth Blackbird and a single (glorious, hi Ben!) day working with Ensemble Dal Niente, I spent a good chunk of time practicing (I’m also a percussionist), got to see a few shows (Florence and My Brightest Diamond were highlights), had the opportunity to premiere a Brian Chase piece with Make Music Chicago, and ate my fair share of tacos (I lived around the block from a late-night shop in Pilsen). My summer with the group marked an early step the Grammy nomination process, so I like to tell my friends (facetiously, of course) that I had a direct hand in TCP winning the award the following spring. A board member hosted a shindig in her beautiful Arts District apartment after a concert one summer evening. Great food, wine, and conversation were had. A funny or embarrassing story from the internship? My fellow intern (Michael Goodman) and I were tasked with putting together “scratch pads” for an Emerging Composer event with Danny Clay and we somehow managed to approach it as inefficiently as possible. I think we spent three or four hours trekking around town buying sandpaper, plastic cups, tongue depressors, etc for what amounted to an arts and crafts project. Why we didn’t just go to the nearest big-box store I have no idea. You can intern for Third Coast Percussion any time of year! For more information about internships, contact Sean Connors: [email protected]. Happy holidays, everyone!